That's right, instead of six pints of light ice cream, I got free samples of seven of their 9 new non-dairy frozen dessert pints. It took me a second to realize that I had gotten the wrong shipment because the branding is similar (though not identical). 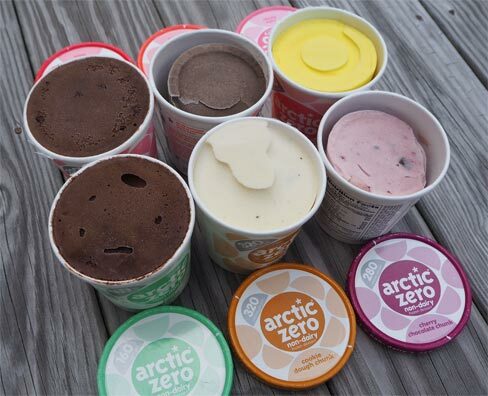 Each flavor is a different color like the light ice cream, but the non-dairy pints have a faded background as well as a solid color on the rim of the lid (so that you can read "non-dairy" writing on it). These new pints are non-dairy (so no whey protein). Instead, these are based on Faba Bean protein. I literally have no idea what that is though I do believe Dr. Hannibal Lecter would approve. Ok, technically he says "fava bean" not "faba bean", but wikipedia says it's a different name for the same bean. 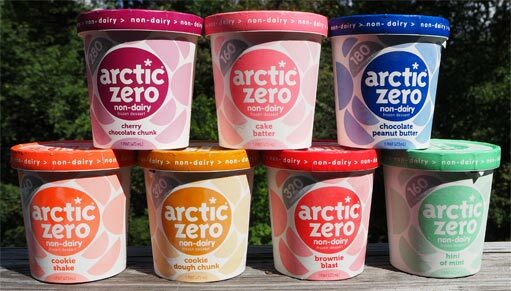 Note: their older pints are still shown on their website under the "lactose free" section. The good news is that these do not have any sugar alcohol in them, but they do use monk fruit concentrate in addition to organic cane sugar. I'm not positive, but I don't think monk fruit bothers me. They've managed to get these down to 40-45 calories a serving on the non-chunk flavors and then 70-80 calories a serving on the flavors with chunks. That's pretty minimal. The bad news is that these didn't ship too well. Dry ice can be a bit brutal and anything that isn't a dense super premium ice cream can suffer during the shipping process. Dry ice is below -100 degrees Fahrenheit while regular ice is just 32 degrees Fahrenheit. That's a big difference (the only alternative is to use cool packs and that can get expensive). As you can see in the picture, it appears that Cherry, Cake, and Cookie Shake fared the worse, while the chocolate ones look fine. Cherry Chocolate Chunk: (bottom right) Once you dig down a bit, this one actually looks really good with a bunch of chips and cherry bits. The flavor profile reminds me of cherry cola. Cake Batter: (top right) This one looks like yellow play dough. It tastes better than it looks. Hint of Mint: (bottom left) I don't think the flavor is bad but the texture is really weird on this one. Brownie Blast: (top left) Flavor is decent but texture is weird here as well. Chocolate Peanut Butter: shown in top picture but not tested. Salted Caramel & Purely Chocolate not sampled. So the ones that did not shrink wound up being the ones with the odder texture. Keep in mind that the pint you pick up on the store shelf won't have the dry ice issues that mine have. Arctic Zero needs to get the word out, and I appreciate the free samples, but the home delivery system isn't perfect for this type of treat. Will probably give one of the 40 calorie per serving ones (most likely Cake Batter after the Cookie Shake warning: sounds like it's more of a vanilla shake with cookies and cream cookies mixed in rather than an actual cookies and cream ice cream/frozen dessert) a shot on sale. I was excited to see a new non diary product low in sugar and carbs! Tried the Brownie Blast and Purely Chocolate flavors, and liked both! Sadly, can't compare with the flavor of the original "lactose-free". In addition, the pints I purchased were all sunken and gummy. I guess it does ship poorly.